We bought some organic Morels at the Troutlake Farmer's market on Saturday. I thought they were quite price for the volume we got. It cost $10 for 1 c or approximately 50-100g. I was not keen on them, not at that price but when D gets something like that in his head there's no fighting it. Morels are interesting for their texture. They have a spongy and 'bubbly', as in Aero chocolate bar 'bubbly', quality. They do not have a very pungent flavour like Shitake or Chanterelles. They do very well, sauteed on their own in a some butter and wine so that is how we did them to fully appreciate BC grown Morels. We were underwhelmed so I think D has got it out of his system. They were nice but a bit too much of an extravagance for everyday and certainly when we do not have a plan for them. That said, we do buy Chanterelles by the bag full when they drop to &lt;10-15$ / lb as they do in the summer. In a sautee pan, on medium heat, melt the butter. Sautee the Shallot until softened, 1-2 minutes. Add the Morels. Sautee until you can smell them, 2 minutes. Add the wine. Season to taste with Salt and Pepper. Serve hot on a pasta. We had as a side just to taste the mushrooms. The Articoke main we had is an abbreviated one from a Lemon Braised Articoke recipe we do during the start of summer when the Articokes are everwhere for 1$ a bulb. We did not see many last year. Oddly enough, D enjoys cleaning fresh Articokes. I would just as soon buy fresh marinated or grilled ones from a good deli to do this but he prefers the whole process. However, it is not Articoke season now and we had these fresh Garlic Marinated Articoke Hearts from Urban Fare. As well, the original dish calls for wilted Baby Spinach but we are using Baby Arugula this time. With the use of the Whole Wheat Fettucini, the nutiness and sharpness of the Argula was great! Start the water boiling for 2 portions of Fettucini. And add the pasta as soon as the water is ready. Cut the Artichoke Hearts in half. In a large skillet, heat the Olive Oil on medium heat. Add the Garlic and Thyme for 1 minute. Add the broth and the Artichoke Hearts. Sautee for 5 minutes partially covered. Reduce heat to low. Add the Lemon Juice and Zest. Cover and simmer until the pasta is ready. When the pasta is ready. Drain in a colander. Add the pasta to the Artichokes and toss. Season to taste with Salt and Pepper. Bring to the table and toss when you are ready to serve. We had our salads first so it sat 'finishing' for 10 minutes. Add more Parmesan and Pepper to taste after serving. Slice the Tomatoes the same thickness. Get as many slices of the Tomato as of the Cheese. Wash the Basil leaves and pick 10 of the nicest, biggest ones. Have more for garnish if you wish. 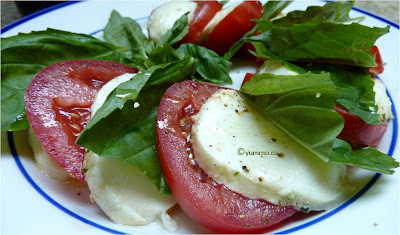 Please 1 slice of Cheese on top of each slice of Tomato and top each with a leaf of Basil. Spread out nicely in a fan or whichever pattern you like. Vigorously whisk or shake the Lemon Juice, Oil and Salt and Pepper. Drizzle over the Salad. So simple and so flavourful. YUMMO!